2018 was another amazing year for insurance carriers looking to sell directly or through other online channels to customers. We reviewed publicly available financial data from SNL Financial (an industry-specific financial market data feed of public and private companies worldwide) for Berkshire Hathaway Direct Insurance Co. (BiBerk), Intrepid Insurance Co., TypTap Insurance Co., Lemonade Insurance Co., Root Insurance Co., and Metromile, to evaluate market trends and wanted to share our thoughts on insurtech, and the progress in the industry. SNL Financial sources the information from annual financial statements filed by each of the insurance carriers. While we acknowledge the existence of factors that may obscure some of the public financial data, such as attributing expenses to a non-statutory entity, we tried to highlight some of the directional observations we could glean from analyzing indicative trends. We analyzed written premium, expenses, losses, and underwriting profit published by these selected carriers to assess their performance for the past year. Next Insurance’s financial data is not included in this piece as we only recently started selling policies as a carrier. However, we’ve been busy selling policies as an MGA—take a look at our performance in 2018 here! Written Premium: Written Premium is the amount of premium a customer agrees to pay for insurance coverage over the duration of the insurance policy period purchased. It typically represents the growth of a company’s insurance business during a given period. Underwriting Gain/Loss: Underwriting gain (or loss) is profit (or loss) generated by an insurer’s underwriting activity. Underwriting gain (or loss) is the difference between premiums collected on insurance policies by the insurer and expenses incurred to service the policy and adjudicate claims and claim payments. Loss Ratio: The ratio of claims paid by an insurer (including certain reserves) to the premiums earned over a given period of time. LAE (Loss Adjustment Expense): An expense associated with investigating and settling an insurance claim (including adjusters, appraisers, legal costs, etc.). All 6 companies recorded positive 2018 YoY growth rates in written premiums. Root led the pack with an enviable growth rate of 1861%. The main driver for Root’s phenomenal growth seems to be its aggressive geographic expansion—the number of states in which the company’s products were offered doubled by year end (relative to the beginning of the year). As of March 2019, Root’s website depicts coverage in 24 states, with another 11 coming soon. 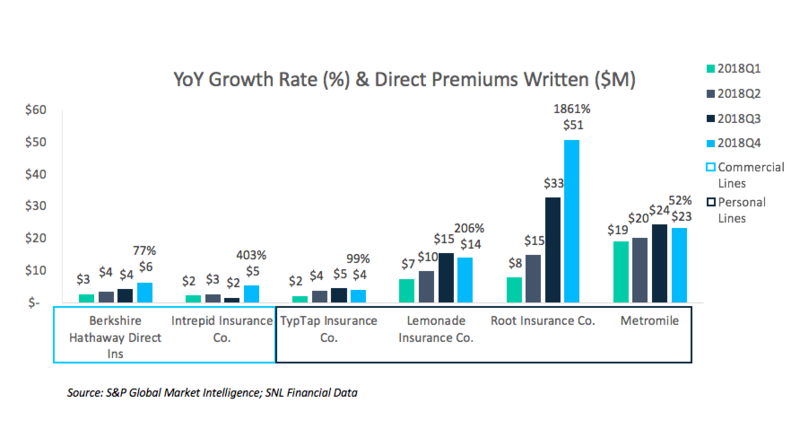 On a written premium basis, venture-backed companies including Lemonade, Root, and Metromile, continued to outpace incumbent-backed startups BiBerk, Intrepid, and TypTap. Personal line customers appear to have fully embraced the direct channel that Root, Lemonade, Metromile, and others have taken advantage of through the development of innovative technologies. We are encouraged by this progress and see similar trends from the small business segment, and the commercial lines products we offer. A significant component of incurred expenses appears to be advertising (a specific advertising expense breakout was unavailable for Intrepid and Metromile). An assessment of advertising expense as a percentage of adjusted total incurred expense is below. (In an attempt to reflect gross incurred expense, we adjusted biBerk’s total incurred expenses to exclude Net Claim Adjustment Expense and Net Commission & Brokerage which served to offset expense). Comparing advertising spend with written premium, Root and Berkshire Hathaway seem to have a similar ratio for the full year 2018. With Lemonade’s change in reporting policy, it is likely not reporting the full amount of advertising spend at the statutory entity. Note that the below written premiums include premiums from both new customers and renewals. So, this helps to explain some of the topline numbers. What about profits? We took a look at two high-level metrics: underwriting gain/loss and loss/LAE ratios to view trends. While there has been some improvement, most are operating at an underwriting loss and have relatively high loss ratios. There is certainly work to be done on this front, but through leveraging technology, learning, scaling and iterating quickly on pricing and risk, progress is being made. Given funding positions, the differentiation that technology brings and the tremendous market opportunity, we are optimistic that creative solutions to some of the current challenges will be brought to bear, and we look forward to another strong year in 2019.